Please note. Access and use of the Southampton and District Badminton Association website (www.southamptonbadminton.org.uk) constitutes acceptance by you of the following terms and conditions with effect from the date on which you first used this website. Southampton and District Badminton Association may at any time revise these terms and conditions without notice. Any changes will be effective and binding from when they appear on the site. 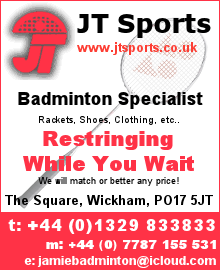 The Southampton and District Badminton Association website is hosted using the BaddersWeb system (www.baddersweb.co.uk), a trading name of EasierThan Website Design (www.easierthan.co.uk), hitherto referred to as EasierThan. This website is run independently of Southampton and District Badminton Association with contributions made voluntarily by various individuals. Any views and opinions expressed are those of the individual and are not necessarily representative of the Southampton and District Badminton Association or EasierThan. Although entered by their elected representatives, all retention and display of personal data is the responsibility of Southampton and District Badminton Association. With the exception of security in limited cases, no liability is accepted by EasierThan for any issues arising from the storage and display of personal data. For more details, please refer to the Privacy Notice. Contributors to the site take all reasonable care to ensure that the information contained within the site is correct. However, Southampton and District Badminton Association makes no warranties of any kind, either expressed or implied, or representations as to its accuracy. Southampton and District Badminton Association accepts no liability or responsibility for any loss, damage or inconvenience due to any errors or omissions in the content of the site or caused by reliance on this information or any other information accessed via the site. It is advised that users check any information before acting or relying on it. Links from this site to third party websites are provided for interest and as part of paid advertising. Southampton and District Badminton Association accepts no liability for the accuracy or content of these websites or for any issues arising from reliance upon said content. Nor, by inclusion, does Southampton and District Badminton Association endorse any product or service advertised on said websites. Should you discover that any 'linked to' website contains inappropriate or offensive material, please contact a site administrator with details so that the link may be amended or removed. As third party organisations, any 'linked to' website services may be withdrawn at any time and without notice. Advertising revenue from this site is used to support its ongoing development and maintenance in partnership with EasierThan. The adverts listed on this site are from third party individuals and companies and any take-up of said advertised products and services is done so at your own discretion. Southampton and District Badminton Association and EasierThan accept no liability for matters arising from the purchase (or attempted purchase) of any of the products or services listed on this site. Nor, by inclusion on this site, do Southampton and District Badminton Association or EasierThan endorse any of said products or services.